What are RFID Blocking wallets? A few of us have been unlucky enough to be pickpocketed while we’ve been on vacation. You reach for your wallet, but realize it’s no longer there. Pickpockets have moved on from old-fashioned theft to something that requires less effort, with the help of technology. Nowadays there’s an electronic way of pickpocketing. Your passport, driver license, and some credit cards are embedded with a chip containing personal information. This RFID (Radio-frequency identification) chip is now being targeted by thieves wirelessly. These RFID chips contain personal information that can be read or duplicated by using a wireless RFID reader. Entire credit card numbers can be read by these sneaky devices. All a pickpocket needs is to be within range of your chip-embedded items. Fortunately, some companies have started making wallets that block RFID devices from scanning your personal information. They’re lined with material that block radio frequencies, preventing wireless communication between items embedded with RFID chips (passports, credit cards) and RFID scanners. It’s difficult to estimate how many people are affected each year by RFID information theft. Most people who have been affected don’t know it’s happened to them. Unless you are diligent about reading your bank statements, it can be easy to overlook. Personally, I’d rather have the peace of mind, especially since RFID Blocking Wallets are now so reasonably priced. 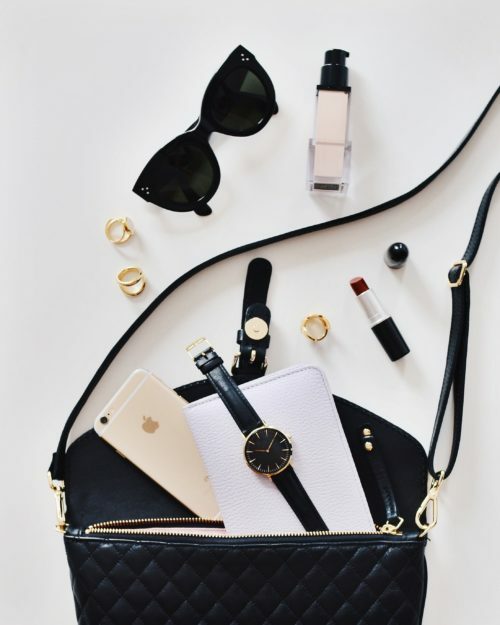 Zoppen specializes in travel accessories and has the best-rated items around. Out of all the options I’ve hand-picked on this list, this is my favorite RFID Blocking Wallet. Can we talk about this rose-gold color? It’s been trending for the last few seasons and I can’t see it stopping anytime soon. For those that like something a little less eye-catching, the RFID wallet comes in 22 colors in Vegan leather to choose from. 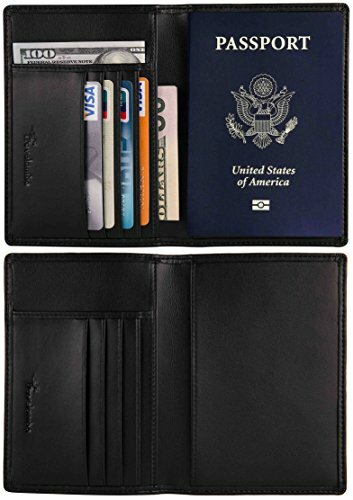 The Zoppen wallet protects contents from an RFID scanner and has several slots to fit a few passports (great for a family), a cellphone, three credit cards, an ID, SIM card, boarding pass, coins, pen, key ring, and small pockets for miscellaneous paper. It’s got you covered in terms of storage. Although it offers loads of space, it is still very slim. I was very impressed that there was a place for everything and felt really organized for once in my life. It’s a great little wallet in its own right, but the RFID protection is the cherry on top. EMBROIDERY DESIGN - Large wallet organizer for women, flower and butterfly embroidery art work. Embroidery is the handicraft of decorating fabric or other materials with needle and thread or yarn. Embroidered purse, both atmospheric grace yet stylish atmosphere. 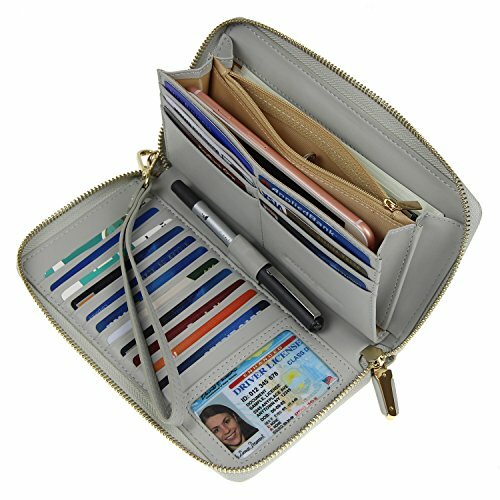 ZIPPER AROUND WALLET - This wallet features great storage capacity and usability. 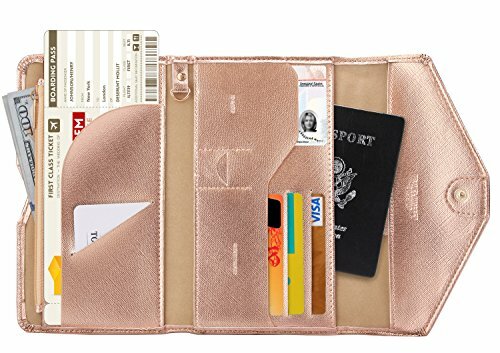 Zip around wallet for women, top single zipper closure for: 17 credit card slots, 2 currency pockets, 1 ID window with central cut out over, 1 inner zipper slot for changes and coins, 1 pen loop. Great for everyday use when you’re not traveling, the Bricraft leather RFID blocking wallet feels luxurious and spacious. It comes in many colors, but my favorite is the gray, which has a gorgeous embroidered design on the outside. Inside you will find seventeen card slots, an ID slot, two full-length bill compartments, a pen holder and a zippered pocket. According to Tripadvisor, Barcelona, Rome, Paris, Prague, Madrid, Amsterdam, and Florence are the worst cities for pickpocketing. Knowing in advance that you’ll be traveling to a pickpocket hotspot, it’s wise to plan how you will protect yourself. 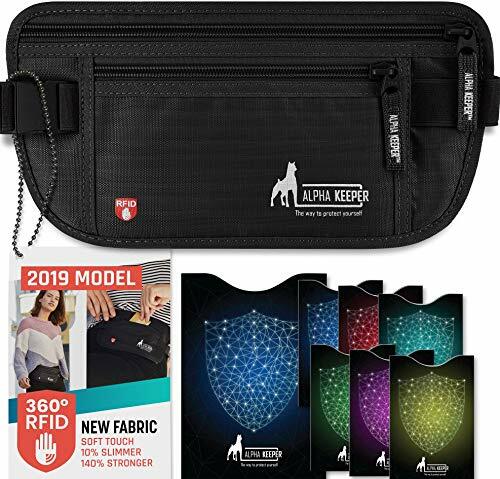 Made with three layers of RFID blocking fabric, the Alpha Keeper belt will block unwanted wireless fraud. At the same time, it will store your cell phone, keys, paper money, credit cards, passport and more. On the front, there are two zippered pockets, which contain inner mesh pockets for added organization. Tucked away in the back, is a hidden pocket for anything you might want to quickly put away. Most money belts don’t feature this handy pocket. The belt is adjustable and closes securely with a buckle. Although I appreciate the spacious design, I would avoid bulking it up too much, so that it stays hidden under your clothes. It also comes with seven RFID blocking sleeves to protect individual cards. You can use some with your regular purse or wallet and is a nice freebie. Great for traveling on crowded subways or tourist areas, the neck wallet from Lewis N. Clark keeps valuables safe and out of sight when worn under clothes. Made of rip-stop nylon, this wallet comes in four colors to choose from. It’s ultra-light and has a slim profile, so it blends underneath clothes easily. I wouldn’t fill it to capacity and wear a tight-fitting shirt, but if you’re like me and wear button-ups and loose blouses, it will stay hidden. The front features two large pockets to hold a passport, phone, and ID card. On the sides, there are 2 medium-sized zippered pockets where you can put different currencies for example. It’s long enough to be worn across your body, so that you can access it from the side of your waist, almost like a jeans pocket. The back is padded with TravelDry fabric for ventilation and it can be hand washed if you’re so inclined. And of course, it’s lined with RFID blocking fabric for extra security. If you like a touch of luxury with functionality, look no further. The Travelambo Passport Wallet is made of 100% leather and comes in six fashionable colors. Many passport holders only have one slot for your passport. However, this comes with four credit card slots and two currency pockets, in addition to the passport pocket. 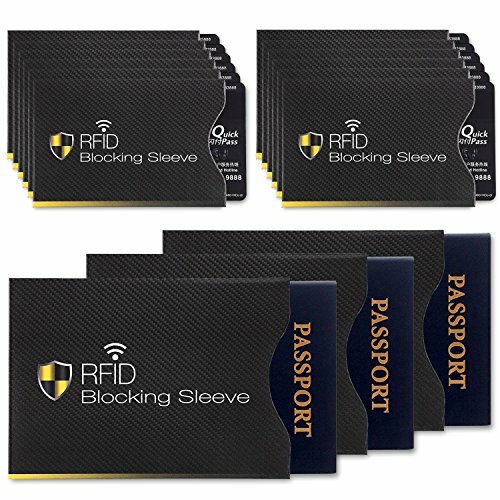 Each slot blocks RFID scanning devices for added security while traveling. It’s slim, feels smooth to the touch, and will outlast most passport wallets thanks to the leather. Similar to the Travelambo wallet, the AC Dream Passport Wallet, comes in a whopping 24 colors. I’m talking glitter, satin metallic, and plain leather finish. Good for the woman who wants to coordinate her wallet with her purse. Guilty. Inside there is one slot for a boarding pass, four credit card slots, a currency pocket, and passport slot. Unlike the Travelambo wallet, this comes in vegan leather. It’s slim and comes in an excellent range of colors for both women and men. I got one for my other half and he loved how slim it was. The Dew Bifold wallet, is a great little wallet with lots of storage and can be zipped up, to keep everything inside secure. It comes in three colors – dark gray, light gray, and rosy pink. 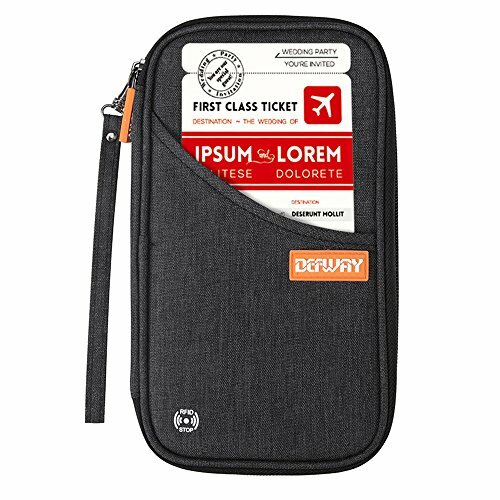 On the outside, there is a removable wristlet and slanted pocket to hold a cell phone or boarding pass, for example. Inside, on the left, there are four passport-sized slots and in the center spine is a pen holder. On the right, you’ve got a removable key ring, zippered pocket for currency, five card slots, and a zippered pouch for loose change. I found the zippers to be strong and the wallet to have good structure. The fabric is rip-stop nylon and is water resistant, which explains the solid structure. 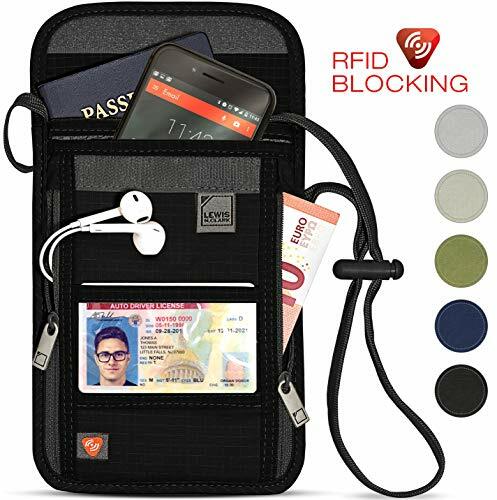 A good choice, if you have average storage needs and want RFID blocking protection. SAFE & SECURE - With advanced RFID Secure Technology which blocks RFID signals and protects the valuable information stored on RFID chips from unauthorized scans. PREMIUM QUALITY - Made of resistant material which is durable, waterproof; resistant to tears or punctures. 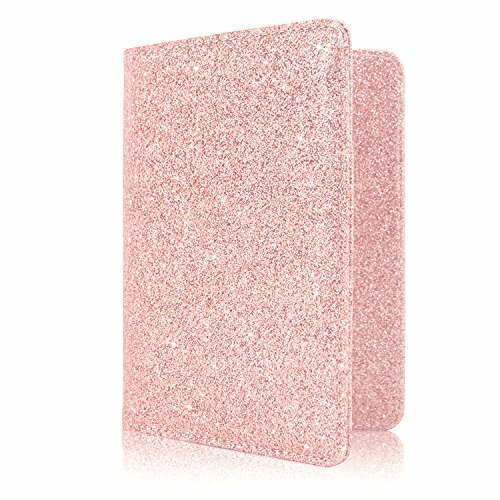 SLIM PROFILE - Design to easily slide into card slots of your wallets, handbags, travel bags without taking up extra space, NOT bulky at all. If you already have a wallet you love, why not try using an RFID Blocking Sleeve instead? They work in the same way as an RFID Blocking wallet and protect your credit cards and passport from RFID reading devices. You slide your card or passport into the sleeve and you get full protection. You might not need all of the 12 credit card sleeves and 3 passport protectors, but you can also give some to friends and family. Have you heard of RFID theft? P.S. 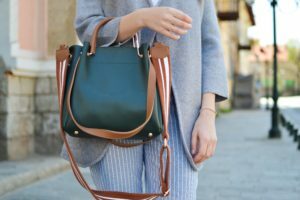 Here are our picks for secure crossbody bags.